At its heart, the story is all too simple: a man and his son take a lengthy motorcycle trip through America. But this is not a simple trip at all, for around every corner, through mountain and desert, wind and rain, and searing heat and biting cold, their pilgrimage leads them to new vistas of self-discovery and renewal. 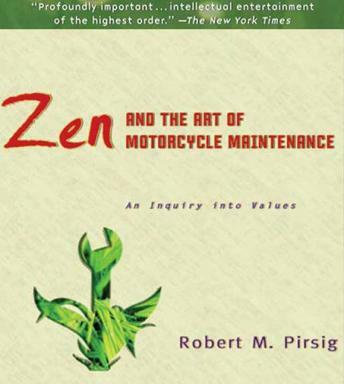 Zen and the Art of Motorcycle Maintenance is an elemental work that had helped to shape and define the past twenty-five years of American culture. This special audio edition presents this adventure in an exciting new way -- for the millions who have already taken this journey and want to travel these roads again, and for the many more who will discover for the first time the wonders and challenges of a journey that will change the way they think and feel about their lives. Loved how the story between father and son and motorcycle weaved its way through lessons in philosophy. Too deep for me. I wanted a story, not a blurred explanation of a crappy life. This is a sophisticated, complex and yet intriguing essential must 'read' for those that want to understand the psychology of and basis of personal values. The structure is effective in the way so much is attached to the basic theme of the 'motorcycle adventure trip', through the plains, river valleys, forests and mountain travelling from Minesotta thru to the Oregon coast. This is a sophisticated book and requires multiple re-assessment over ines lifetime. Third time it has absorbed my attention and still have not fully gained all that is presented. Challenging but brilliant. This book is genius. It led me down a path that sometimes was difficult to follow but ultimatley was very rewarding. Not for the faint hearted it can get pretty in depth at times and requires your full attention in order to keep up but it really pulled me up a few notches on my evolutionary journey.